This summer has been a bit of a success for me! I started really paying attention to walking. I found a coach and we have been steadily increasing how much I could walk daily and how long I could walk in a single attempt. It's been enough of an improvement that I started looking dreamily down hiking trails and wishing I could take longer walks that went places besides close to home or around my car. Last month Dad and I designed this cane to use when I'm hiking. 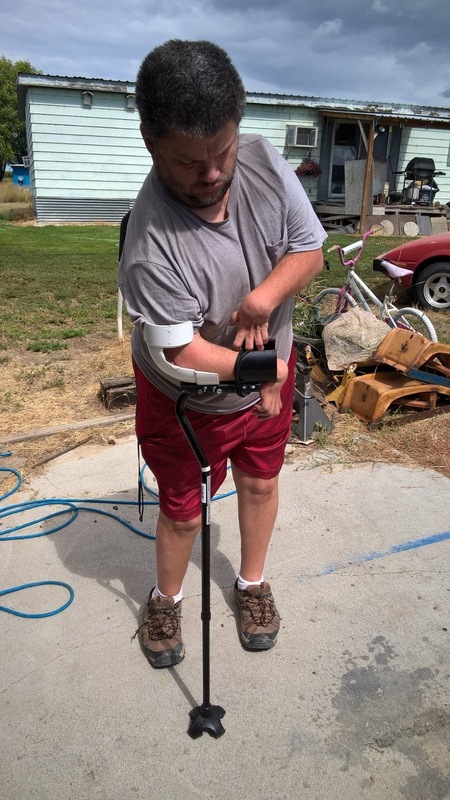 His pictures of the cane triggered a heartwarming response on Facebook. As we were creating the cane, however, I realized that I'm still going to fall out there. That led to the realization that I'm going to have to re-learn how to get up after a fall. Getting up from the ground implies getting down on the ground. Looks like I'll have plenty of chances to practice falling, too. Hopefully by winter, I'll be less fearful of falling so I'll go outside more than I did last winter. Learning or retraining myself on a physically weak area like getting up after a fall is a really visceral and physical experience. I'm hoping the experience will be more universal than just watching a guy flounder on the ground. Sharing the process with others, I hope, will will inspire others to plan improvements for their own lives. As a storyteller, I'm sure there will be a story out of all this. It'll be fun telling the final and even intermediate stories. I can totally see myself falling on stage and freaking everyone out until they realize it's what I'm telling about. ...and that's how this project was born. I am not just creating a neat and pretty story, I'll be creating a new me. It's going to be great and fun and I'll finally be able to go on long walks and hikes and fall down as much as I want! It's going to be long and tedious and I may give up again and again. I am starting today. This is what you're reading right now. So watch this new blog! I'm going to fix this weakness in front of the whole world. I hope the project attracts help and wisdom I might not have right now. In turn, I hope to share that wisdom with others, as well. I'm curious what types of responses the project generates.